EAST VILLAGE — After 28 years of homelessness, Christopher Gamble is finally in an apartment — but his shadow will remain on the street. 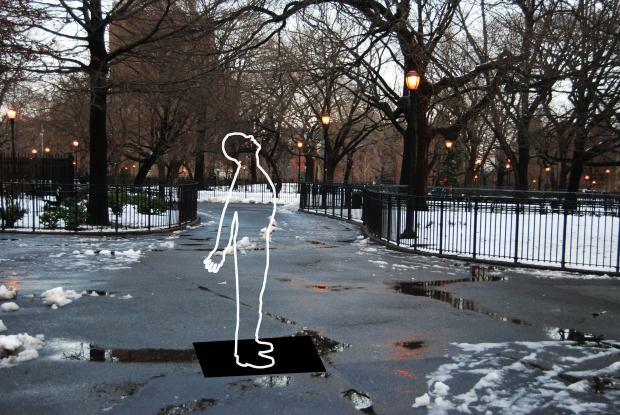 A life-size sculpture of his silhouette is currently being created by French artist Fanny Allié to be installed at Tompkins Square Park, a place where Gamble spent many days and nights. The sculpture, an initiative of the city's Parks Department, will likely be installed in the coming weeks and will remain in the park throughout the summer at the Avenue A entrance between East Seventh and Eighth streets. "I thought it would be good. Why not?" said the 67-year-old Gamble, on why he agreed to pose for the sculpture. "It's exciting for a person that doesn't really mean anything to anyone." The sculpture will consist of a metal outline of Gamble, according to Allié. "I like it because it has some hope. It's a positive," the artist said of the silhouette's open stance with arms outstretched to the sky, like “he is about to fly." When Allié got the commission from the Parks Department, she said she never intended to focus on homelessness, but wanted a silhouette of a park regular. "I was standing in the park taking photos, and he came up and started talking to me," said Allié, who will present the proposed idea to a Community Board 3 committee on Thursday. From there the two met for coffee, and Gamble told her his story. As an adult, he wound up homeless when he and other tenants were evicted from an East 14th Street apartment building, he said. From there, the city's subway tunnels turned into a comfortable home. "The storage spaces within the tunnel — I claimed it for myself and put a lock on it," said Gamble, who has never held a conventional job. "At night I would just walk off the platform [to the space]." "I had electricity, running water — all inside a train tunnel." A small income came from finding treasure in the trash of wealthy neighborhoods and selling them on the sidewalk. "It is amazing what people throw out — gold, clothing," Gamble said. "There is a fortune out there and people don't know it." Now, he lives in an apartment run by the city nonprofit Bowery Residents' Committee with three others housemates. "At least now I can see the light of day," Gamble said.